← Be Good to Our Animal Kingdom…Large and Small! My sweet sister, Fran, died unexpectedly twelve years ago. She was the mother of three precious children and had a wonderful husband. I had great difficulty reconciling her death and coming to terms with such a devastating loss. I was missing her so terribly. Life did not feel the same without her wonderful presence in our lives. My heart was hurting so and I desperately needed an avenue for peaceful resolution. A kind friend was striving to help me to find a way to heal. She gave me a journal knowing that it could be an avenue to help in organizing my thoughts and expressing my inner feelings. I initially did not feel like I could find the time or the energy to do it, especially since my mind was full of roller coaster emotions. I was sure that I could not put into words accurately enough how I truly felt. However, I found myself one night making an attempt. It was interesting that I did, in fact, have a lot to say—pent up emotions that needed a place to land. It was not a homework project, so there was no pressure. It was just for me. There was no wrong answer. You don’t have to worry about grammar or misspelled words. Journaling proved to have healing powers and it was an ultimate avenue to organize my thoughts and emotions—extremely valuable. I wrote one page the first night– a powerful first page. I realized that journaling was going to be an excellent way to find a way to aid in my pain. It became a catharsis towards finding hopeful healing for my hurting heart. I knew that Fran would want that for me, too. In addition, I decided to keep two journals. One was for my deepest emotions due to the pain my heart was feeling. The other was a “Happy Journal” where I wrote down small pleasures from the day—the small moments that provided milliseconds of joy. It forced me to be aware of looking for the tiny moments in life that bring about delight. I was becoming aware that, in spite of my pain, the world was still a wonderful place. I documented it every day. I began looking forward to my journal time each night. The grief process involves baby steps, but if you allow yourself the slow walk down the complicated path of grieving, there is hope to be whole. Always keep in mind that our lost loved ones would want us to be content. Journaling allows you to come to terms with any type of stressful events in your life that need to be addressed. It is ultimately an avenue as an aid for your own emotional and physical health. It could help to reduce headaches and high blood pressure and induce good levels of nourishing sleep. It is imperative that you pour your emotions out honestly—your inner most thoughts so that you can examine all the feelings and find a way with which to deal in every day life. It can be a catharsis and a journey of self-discovery. Writing it out is an honest avenue towards healing the pain in your heart, soul and mind. It is a cleansing of the mind and an opportunity to clear out the clutter in your conscious and subconscious mind. I would advise that you try to write for at least thirty minutes a day for as many days in a row as you can allow for yourself—whatever is the most comfortable for you. Concentrate on each issue that is bothering you, as you examine the negative and positive emotions. Read back over what you have written and reflect on it. It is also interesting to be able to look back over previous writings to see the progress that you have made through adversity and the hope for moving forward…. 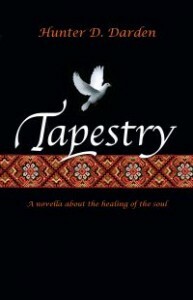 Another helpful aid for me following Fran’s death is that I began writing a novel called Tapestry—a novella about the healing of the soul. The main character, Olivia, has suffered losses throughout her life. She journals at the end of each chapter. In addition to my personal journaling, the writing of Tapestry proved just as cathartic and an avenue for grief resolution. Ultimately, the realization for me is that in the great “tapestry of life,” we must embrace the knots and learn from them. It ultimately makes the gold and silver threads that much more beautiful. Thanks to the beauty of being able to write out my inner emotions, I was able to find a way for my hurting heart to begin healing following the long journey. It is comforting to know that my words are helping other hearts that hurt. That is the great return……….. Personalized copies of my books may be ordered by scrolling to the top of this page and clicking on the link or email me at hunterdarden@gmail.com. This entry was posted in Uncategorized and tagged a novella about the healing of the soul, journaling, tapestry. Bookmark the permalink.